Preplanning is a decisive phase in the engineering process. It involves developing concepts for technical machinery/plant design and estimating initial volumes of project data. 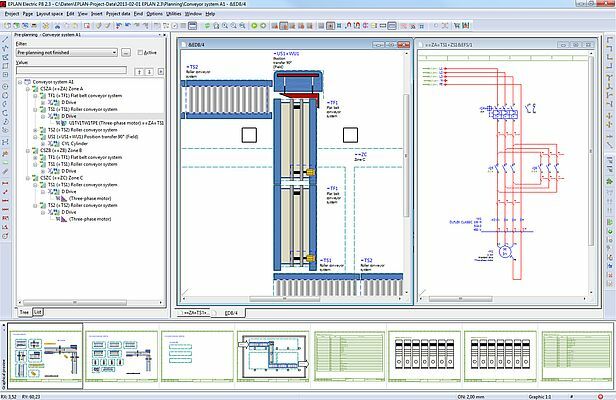 Whether it is graphical overviews, placeholders for functions, initial project data for drives, sensors and PLC inputs/outputs, or parts lists for calculations, comprehensive preplanning tasks can be processed directly in the Eplan Platform 2.3. The subsequent enclosure production and detailed design of the system is based on this comprehensive data, without new data entry or transfer from other systems. Users can benefit from very easy entry into this new planning method based on the platform. This additional integration allows users to increase data consistency and project quality. At the same time, it reduces the cost of the project development process. Automation "From a Perfect Cast"